Keltner Channels from Chester Keltner in How to Make Money in Commodities (1960). Dr Elder also developed SafeZone Stops based on Directional Movement rather than Average True Range. Chandelier Exits are primarily used as a stop loss mechanism to time exits from a trending market. Chandeliers cannot be used for entries like some other volatility systems as they would be prone to whipsaw in and out of a trade. 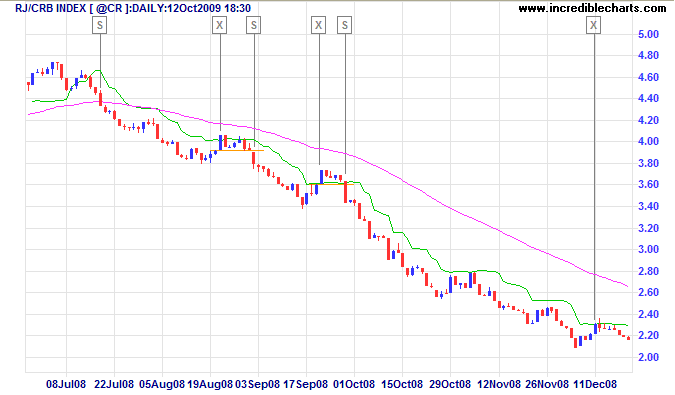 The RJ CRB Commodities Index late 2008 down-trend is displayed with Chandelier Exit (short, 22 days and 3 x ATR) and 63-day exponential moving average used as a trend filter. Entries are taken when price makes a new 5-day low while below the moving average (or 5-day high when above the MA). The time period must be long enough to capture the highest point of the recent up-trend: too short and the stops move downward; too long and the high may be taken from a previous down-trend. It is not essential to use the same period for up and down trends; down-trends are notoriously faster than up-trends and may benefit from a shorter time period. The multiple of 3 may be varied, but most traders settle between 2.5 and 3.5. No new high is made during the selected time frame (22-days in the earlier example). Welles Wilder’s Volatility Stops formula eliminates the second issue, but uses Closing Price rather than Highs and Lows. Average True Range Trailing Stops, on the other hand, offer both High/Low and Closing Price options and use a ratchet mechanism to prevent stops from falling during an up-trend or rising during a down-trend. Below When the price moves above the 21 day moving average we are ready to trade, and when the price fully moves below the 21 day ma then we are ready to sell. Volume is a measure of how much of a given financial asset has been traded in a given period of time. It is simply the amount of shares that trade hands from sellers to buyers as a measure of activity. The information on this presentation is for educational purposes only. It is not intended as financial or investment advice, and should not be relied on as such. Before making any commitment of a financial nature you should do your own research and seek advice from a qualified and registered investment adviser. Plain and simple, a stock is a share in the ownership of a company. Stock represents a claim on the company’s assets and earnings. As you acquire more stock, your ownership stake in the company becomes greater. Whether you say shares, equity, or stock, it all means the same thing. A major criticism of technical analysis is that it only considers price movement, ignoring the fundamental factors of the company. Technical analysis assumes that, at any given time, a stock’s price reflects everything that has or could affect the company – including fundamental factors. Technical analysts believe that the company’s fundamentals, along with broader economic factors and market psychology, are all priced into the stock, removing the need to actually consider these factors separately. In technical analysis, price movements are believed to follow trends. Once a trend has been established, the future price movement is more likely to be in the same direction as the trend than to be against it. Newton’s first law states that every object will remain in a similar motion unless compelled to change its state by the action of an external force. Another important idea in technical analysis is that history tends to repeat itself, mainly in terms of price movement. The repetitive nature of price movements is attributed to market psychology; in other words, market participants tend to provide a consistent reaction to similar market stimuli over time. Technical analysis uses chart patterns to analyze market movements and understand trends. Although many of these charts have been used for more than 100 years, they are still believed to be relevant because they illustrate patterns in price movements that often repeat themselves. How to use software to analyse the stock market. Types of charts and trends. The more You research, learn from history, study what others are doing, improve your math & science skills. Plain and simple, a stock is a share in the ownership of a company. A Stock represents a claim on the company’s assets and earnings. As you acquire more stock, your ownership stake in the company becomes greater. Whether you say shares, equity, or stock, it all means the same thing. Dow said that share prices tend to move in trends and that trends tended to continue until a major force acted to stop them. Dow identified three types of trends. •An uptrend is when each successive high point is higher than the previous high, and the low points on the price chart also rise progressively. •A downtrend is the opposite situation. Each successive low point is lower than the previous one. •The third trend is when both averages fluctuate within a range of about 4% of the same value. Commonly referred to as ‘trading sideways’, Dow called this a ‘line’.